In recent years the ECB has generated revenues averaging around £145mn per year, of which something like two-thirds, close to a £100mn, has come from broadcasting. The deal with Sky announced last year to start in 2020 has been widely reported as being worth £1.1bn over 5 years, much bounty, and on the face of it more than twice the current sums. As to where it is going to be spent, media reports this summer now gone have given figures of a £40mn budget for the new ECB competition, closer to £60mn once the payouts to the counties have been allowed for. Specifically mentioned, £8mn to the players, but the details of the rest a bit of a mystery basically; plenty left for marketing, staging fees and so on and it would be a sad state if a big part of it was not for promoting participation. But looking at the general picture, the £1.1bn figure suggests around £120mn more every year, so are the sums that have been mentioned in relation to the 100 so far really only half the story? Or was the headline number for the Sky contract a certain sort of overstatement, knowingly done, made available to encourage the adoption of a new ECB competition at a time when it had not been agreed? A part of the answer to this question is how solid, reliable, any of these numbers are: the £145mn figure comes from the ECB’ s accounts, averaged out over the last four years, so allowing for the fact that revenues are considerably higher in a World Cup year. The broadcasting revenue comes from the ECB’s Annual Return for 2016, which that year gave a detailed breakdown: for 2015, a World Cup year, and 2016, not; a little bit of extrapolating the 2016 figure to two other non-World Cup years gives an average figure near £100mn (£2018). In short both numbers are solid enough for a look at the general picture here. More questionable are the sums reported for the 2020 Sky deal. A first question is how much of it is guaranteed, how much add-ons. If the ‘game-changer’ of a deal is dependent on add-ons, there seems to have been no public mention or hint of it so far; the words ‘up to’ that are used sometimes in reporting the contracts and transfers of footballers absent. The ECB’s Annual Return shows that (relatively small) sums were paid then from an option Sky had; the open question here is whether a much bigger deal is much more dependent on options held by the broadcaster. To be sure there are other factors that could create a sizeable difference between the headline figure and ‘actual’ revenue to the ECB: tax payments pull the numbers one way, bounty from the World Cup(s) the other; although it is certainly possible that there will be £10mns extra per year from 2020 aside from the 100 budget given so far, a tester to be sure for the ECB board doing direction for the game as a whole. To be spent quite how if so? In the generality of things the game has a problem with too many TMGs and declining participation, to which the response of the business minded governing body thus far has been to partly nationalize the sport; ownership, production and regulation of the new competition, the ECB. There are fundamental reasons why other governing bodies in other sports do not do this, the problems surrounding a common owner of two teams playing one another being one of them. It is a no-no in football and is the first point covered in the FA’s Owners and Directors Test, there in the interests of maintaining some degree of sporting integrity. The ECB appear to be treating this as a secondary issue, which in a sport that has its share of gambling issues is a poor signal to give. While the Surrey team taking to the field in the opening fixture against Hants (above) look generally together, there were not that many signs of the season that was to come. 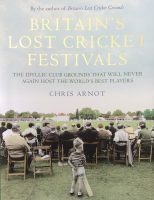 In early summer form there is of course little or none for anyone and the Oval wicket in particular had its reputation for doing draws. 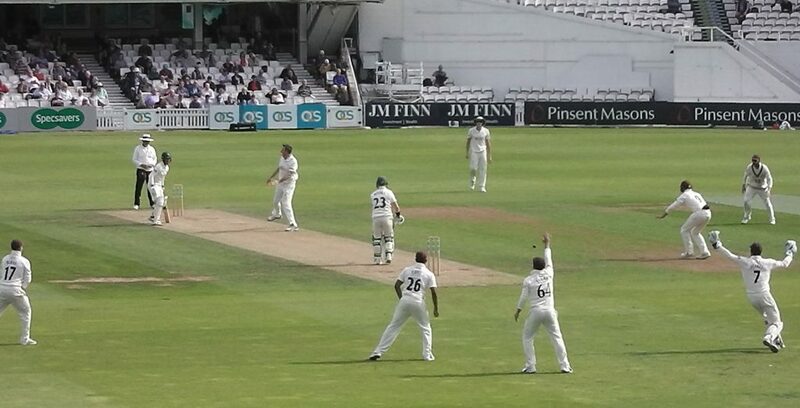 The fourth game and Sam Curran taking a 10-for against Yorkshire gave their season momentum, an innings win to be followed by those against Hants, Somerset and, in July, Notts. From the spectating end of things the Championship was by then on hold rather, but June did mark a visit from teams of Aboriginal cricketers a 150 years after the 1858 tour, and at the end of July there was an entertaining KSL match between the Surrey Stars and Lancashire Thunder; t20 cricket at the Oval with a Championship-type ambience and a competition that deserves a more settled future than it currently seems to have. 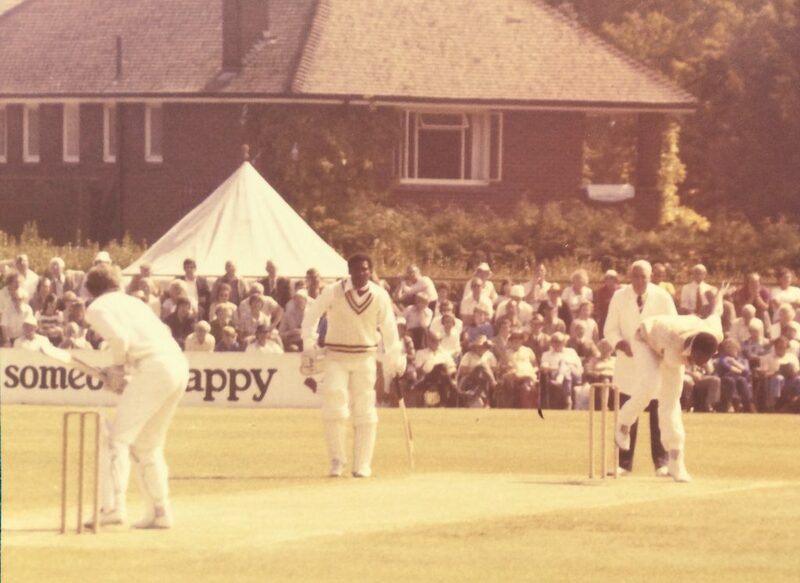 The first tied match in the history of the Championship was the Surrey v Lancashire fixture of 1894. This year might easily have been another one, a really well contested match (Surrey 211 and 306, Lancashire 247 and 264), and, at the end, with six the difference, Matt Parkinson fended at a delivery from Morne Morkel and was instinctively, brilliantly, caught at short-leg by Will Jacks. It was a gripping final afternoon and a crucial, if not decisive, moment in the season: what turned out to be the penultimate ball from the other end was a swing from Tom Bailey that did not connect with a very short leg-side boundary; and had the result gone the other way it might have unsettled Surrey’s campaign, de-railed it even. 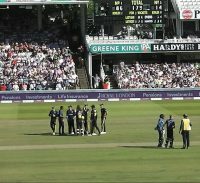 By the end of the Notts game the following week (below) the body language of the players suggested another story, and Somerset then did tie their fixture with Lancashire; the 24th in the competition’s history. Early September brought the final Test with India, much attention with and appreciation for the career of Alistair Cook. There was also an interesting final day when for a time the Indians were on course to emulate their 1979 predecessors; the year of Sunil Gavaskar’s double century, when they drew a match at the ground scoring 400+ in the 4th innings. At the end of this one there were markers of Sam Curran’s progress as he set up Jimmy for the final delivery of the series. 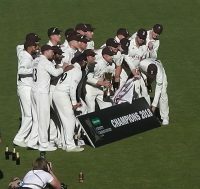 Surrey were no question very worthy county champions in 2018 and there was an excellent finale with the champions of 2017; the heightened senses of don’t miss a ball cricket on the final afternoon for a second time, nearly but not quite a record comeback, nearly the 25th tie. To be sure they have a financial advantage over other counties, part of which is returned to those who come to watch: £142 for the Championship and List A season, 12 guest tickets included, £5 for a KSL match and in the way cricket does bargains £20 for the 5th day of the Test. Reasonable sums in any year, although the cricket in 2018 exceeded reasonable expectations by a distance. It also funds high-end signings, Morne Morkel this year; with a career of more than 80 Tests behind him it was very evident just much he cared about playing county cricket this summer, which for those spectating was a very good thing to see and a message to others. 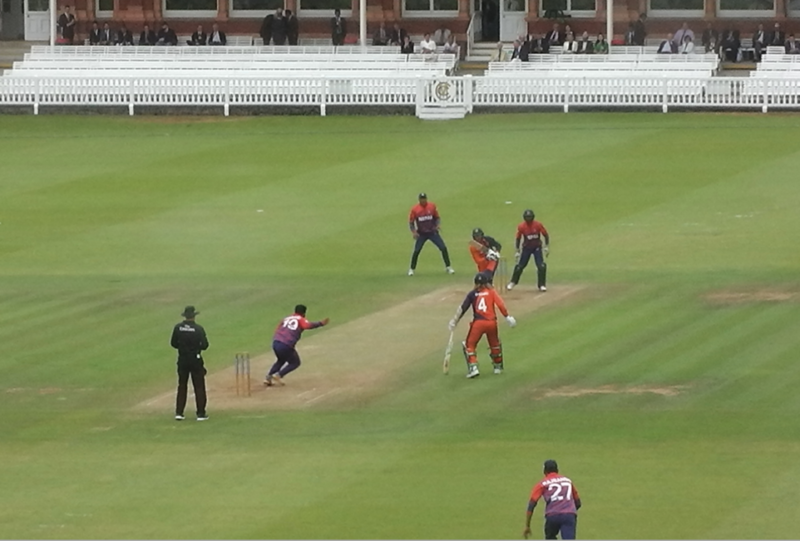 Lancashire Lightning versus Yorkshire Vikings, Now TV, 20th July; MCC versus Nepal versus Netherlands, 29th July, Lords; Surrey Stars versus Lancashire Thunder, 31st July, the Oval. The Roses rivalry produced a game of short form cricket that was about as good as it gets and, rather unusually for T20 cricket on TV, the memory of this match, which won Lancashire by 1-run, might actually last for a while. 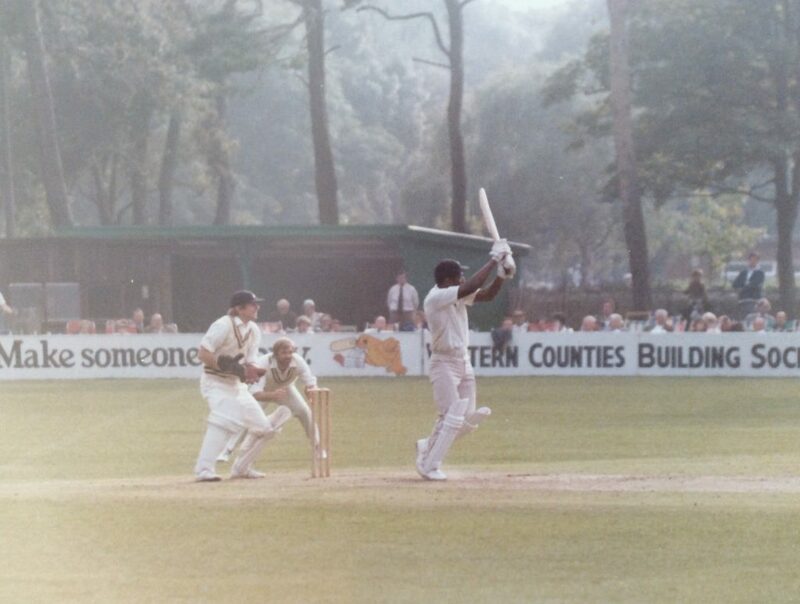 It also helped set up the Championship fixture that followed afterwards, a message for the fixture schedulers maybe, but overall Counties 2 ECB 0 in the week after the football World Cup. 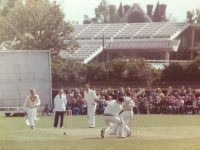 The MCC’s triangular tournament deserved better luck with the weather, but the two ICC associate nations did get some time out on the hallowed turf, and for the Marylebone Club players, there was two 36-ball contests as well. An afternoon helped rather a lot by the noisy, infectious, enthusiasm of the Nepalese support, several hundred in the Grandstand, the nature of which was rather similar to that given at some of the events during London 2012. The Dutch in the crowd did European style support and there was also a sprinkling of MCC members in attendance. The non-aligned were not very many; this blogger was one, curious enough to go, but there mainly from having been a heat wave absentee from a Blast fixture earlier in the week. 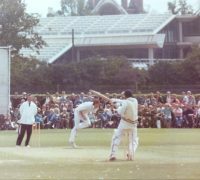 Two days later July was dressed up again and playing her tune at the Oval, where the KSL fixture was played in front of a weekday sized county audience, and despite the ground gearing up for the men’s match in the evening, it had much of the ambience of a county game. The match was dominated by the performances of Natalie Sciver who made an undefeated 95, and Nicole Bolton who replied for the visitors with 87, out leg before to the Surrey star and Star. In the end the visitors won with one ball to spare following a 4, then 6, after threatening to implode; a good T20 finish. 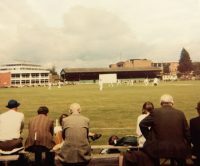 The match evidently held the attention of those watching and for an afternoon’s entertainment at the people’s Home of Cricket £5 still and a bargain. From which a couple of observations: as a spectacle the shortest form of the game is very reducible to its fundamentals of boundary hits, moments of brilliant fielding and extras referred to under a variety of names, taking singles and coming back for a second included. To which fine taken for what it is, the Roses contest was in practice 84 balls this year and it would have been hard to have been a much better watch if it had been 120. Or a 100. If the short form of the game is going to expand globally via the Olympics, it would not be at all surprising to see it played as T10. Whether the cricket is played in Manchester or Kathmandu, history and context is a gift to the present from the past; a fundamental that the ECB certainly appears to be trying to ignore with its proposed competition from 2020. 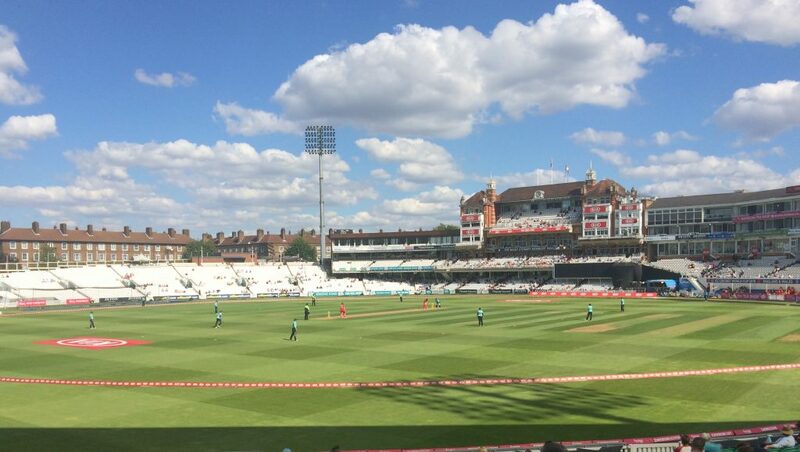 The MCC triangular tournament had obvious purpose, but sitting in the Lord’s Grandstand and looking the other way did prompt the thought who is going to identify with the 8-gon tournament coming in from the Nursery End? Does the toss in the T20 Blast give an advantage to the team who wins it? The % of games won by its winners over the years in the competition under its various names is shown in the chart below, together with the % of field first decisions. In eight of the fifteen seasons its winners have won more games than they lost, in the other seven years the opposite. The numbers bounce around from one year to the next, in most years alternate above and below 50%, which they could be expected to do if winning the toss had essentially no effect on the outcomes of matches. Overall since 2003 the win % is 49.8; a pointer suggesting an answer to the question of quite possibly not. As to the field first decisions made, the big shift to a preference for fielding first is striking; a previous bat/bowl ratio of around 70: 30 reversed over the present decade; conventional wisdoms about how to apply pressure on the opposition old and new, from which a reasonable inference is that captains, and the supporting cast of analysts as maybe, presumably do think there is, or at least might be, an advantage to exploit. In general terms the overall numbers sit comfortably enough with the simple observation that winning the toss could be decisive in very tight matches, and with the view that a bit of luck should be a factor in sport but that the extent of any advantage be simply not large enough, often enough, to impact the win% figures. But the numbers do also prompt the question of why the current preference for fielding has gone as far as it has and also whether the decisions that are made are due for another shift? The second chart shows the % of games won batting first and fielding first. In 2017 in rounded numbers the teams who won the toss chose to field 68% of the time, won 44% of the games, of which batting first they won 47%, fielding first 42%; which might not unreasonably prompt the thought that there were too many decisions to have a bowl first. Standing a year ago and looking back on the then previous 2016 season, the respective numbers are 69%, 57%, 54% and 58%, which might not unreasonably prompt the opposite thought. In other words relying on the numbers for just one year could be rather misleading; in the early years of the competition, when the decisions made were towards batting first, there was for a time some supporting evidence of teams winning proportionately more often batting first. In the last few years it is hard, or at least harder, to say the same for the current preference for bowling first; not only do the win% tend to alternate from year to year, but also the breakdowns of wins when batting and bowling first as well. It is, of course, possible that there could be a systematic advantage from the current bowl first decisions, even with the numbers above, but that the influence is conflated with other general and/or in-play influences. Some of which influences may also be measurable and possible to (statistically) model, but absent plausible evidence on this, the question is why is the toss anything more than a way of just starting matches?